How do I use W00T!? Magnificent munch by the handful. Great compliment to wine and beer and pairs beautifully with a cheese plate. Sprinkle W00T! atop a wheel of Brie cheese and bake lightly. Dust your salads, soups, crepes, pancakes, and waffles with W00T!! Add flavor and crunch to ice creams and baked goods; perfect to top a fruit pie, crumble, muffins and coffee cake; sprinkle W00T! atop your next batch of brownies. What kind of ingredients are in W00T? Premium ingredients are essential to W00T!’s success. WOOT!Granola is vegan and wheat free. We use whole ingredients without processing and no added preservatives or food coloring, choosing organic ingredients as much as possible. When I can find something local, like Maryland Maple Syrup, it’s a bonus. 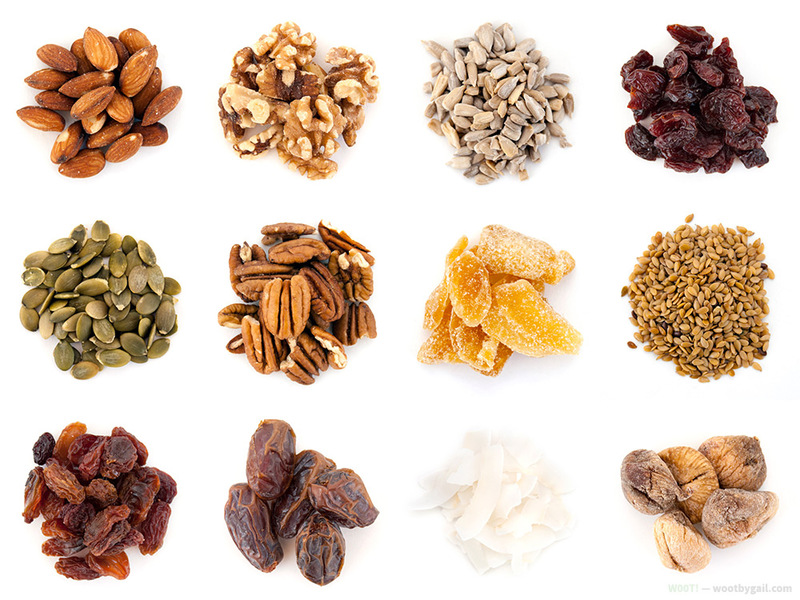 Sampling dried fruits, nuts and seeds is necessary to select the highest quality ingredients. Specific purveyors of Michigan dried tart cherries, organic coconut flakes, crystallized baby ginger root, large, plump raisins, golden flax seeds and organic oats are essential to the quality of W00T! What makes W00T! different from other granola? W00T! recipes all contain 60% dried fruit, nuts and seeds, and have significantly less sweeteners, oils, and grain carbs than typical granolas. 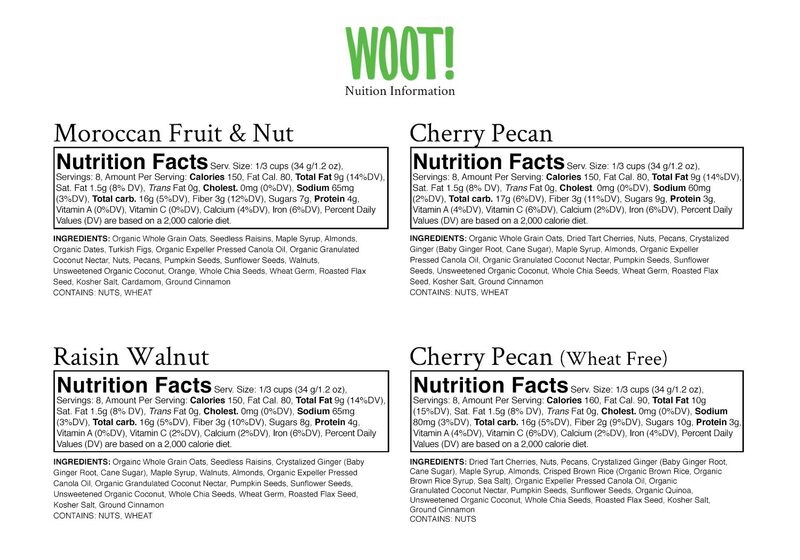 No refined sugars or processed ingredients are added; the nutritional and fiber value of W00T! is superior to other granolas. W00T! is hand-made in small batches. Unique ingredients and spices like crystalized ginger, cardamom and glazed orange rind create the addictive W00T! flavors. Premium ingredients, often organic, and all natural are hand-selected for a unique vegan, wheat free product. Look at these pictures and you will see the difference. How long is W00T! good to eat? W00T! is vegan and wheat free and is extremely stable and will remain tasty beyond the best by date on each bag. If W00T! is exposed to humidity, the toasty crunchiness may soften. To return W00T! to its crunchy munchy state, pop it in your toaster oven at 250 for 10 minutes and the lovely crispiness and toasty flavor will return in a jiffy. Heating for longer than 10 minutes may make dried fruit very chewy. Do you have a store I can visit? W00T! hops, skips and jumps around town. Check below for locations, or email gail@wootgranola.com to place an order for local pick up or delivery or order here on our website. I have Food Allergies, can I eat W00T!? W00T! is vegan, wheat free and safe for a low-gluten, non-dairy diet. WOOT!Granola is baked in a food incubator where soy, wheat, tree and ground nuts are present. W00T! mixes contain many types of nuts. Please contact us with any specific questions or concerns. Can you change the ingredients? Yes, I make custom batches for customers with specific ingredient preferences, seasonings and textures. I have been developing theme mixes, which are great gifts for birthdays, weddings, showers, and holiday celebrations. A theme flavor is also a great business gift that can reflect your business’s personality with flair! Please contact us to get started. How should I store my W00T? Store your W00T in an airtight container in a cool dry location. Do not refrigerate, as the refrigerator’s humidity will dampen the W00T!’s crunchiness. I would like to carry W00T! granola mixes in my retail location. Wonderful! We are happy to grow our retail availability. Please contact us to discuss. Do you do weddings/corporate gifts and custom orders? I make custom batches for customers with specific ingredient preferences, seasonings and textures. I have been developing theme mixes, which are great gifts for birthdays, weddings, showers, and holiday celebrations. A theme flavor is also a great business gift that can reflect your business’s personality with flair! Please contact us to get started. What do I do if there is a problem with my order? We will do everything necessary to make sure your order arrives on time and that you are pleased and satisfied. Shipping We prepare all orders individually and need at least 48 hours for preparation. We ship on Wednesdays via the service you have selected, and make every effort to fulfill orders as efficiently as possible. Orders placed on Thursday through Sunday will be shipped on the following Wednesday. Orders placed Monday through Wednesday will be shipped the following Wednesday. We will send you a shipping confirmation as soon as your snacks are on their way. If you prefer to delay your shipment date, please let us know by email with your preferred Wednesday shipping date. Feel free to contact us with any questions.